I first began using Kiehl's products about 3 years ago when a friend told me about a lotion brand which did wonders for anyone with dry skin - which is definitely me *raises hand*. Since then, I've been gradually expanding into their other skincare products and these Kiehl's products have migrated their way into my everyday skincare routine. These products have stayed on my bathroom counter for the past year (and more) and my skin could not be happier. This lotion is lightweight, non-greasy, unscented and keeps my skin happy year round. It soaks into my skin really nicely and doesn't leave a feeling of product lingering on your skin. The Kiehl's website even states 'We're confident you will see healthier, revitalized skin in 28 days. Guaranteed or your money back.' They really stand by their product, and I must say I agree with their statement. I've always had a problem with dry skin, and I can safely say that since I've began using this I have not had those dreaded dry patches around my face - which is a definite plus for me. Especially in the midst of Winter. The one downside to this product that it is a jar and I have to dip my finger into it - but since I only apply this in the morning after I've washed my face and at night after I've showered it isn't really too much of a problem. Hello favorite skincare product in the world - the hype is real and there's a reason why this product has been making it's way around the blogging community for years. This is probably my favorite skincare product to put on of the bunch. The first time I tried this I was with my mom helping her to find a new eye cream. Since I had heard so much of this I suggested it to her. The sales associate helped her with this and showed us how much this instantly brightens the eyes. I'm not sure if it was the lighting, but I definitely saw a difference for my mom's eyes. My mom was sold and she bought the product, and I kept sneaking into her bathroom to use the product. I eventually gave in and bought myself a jar. I've now gone through two containers and I'm quickly trying to use up what's left of my Bobbi Brown eye cream so I can get on with buying my third. This product has a thicker consistency which nicely pats in under the eyes. The first time I used this I thought it was strange, but after a few uses I really enjoyed the feeling that it was really sinking into my skin. This product was an EssieButton suggestion (#essiebuttoneffect forreals), and after hearing Estée talk about this I really wanted to try it. I got the smaller size as I wasn't sure how my sensitive skin would react, but all has been well and the oil has not caused any breakouts. This product literally lasts forever, I usually use 2-3 drops max for my whole face and neck. I put this on right after I get out of the shower and let it soak into my skin while I finish brushing my teeth and drying my hair. Afterwards I top it off with the Ultra Facial Cream and Creamy Eye Treatment and I'm good to go. I wouldn't say this is too oily, but it may feel slimy when you're sitting around, but you wake up with super soft and (super) happy skin. All in all, Kiehl's has a special place in my heart and on my bathroom counter. I would highly recommend the products if you haven't tried any! 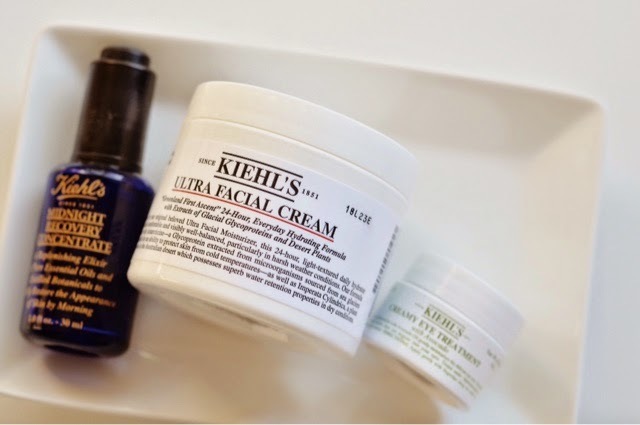 What are some of your favorite products from Kiehl's?